A quick doodle for Illustration Friday, just so I don't get out of the habit (it's easy to do). 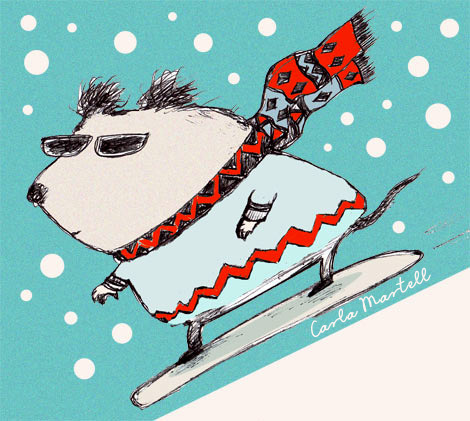 The theme this week is 'disguise', and this is an animal disguised as a snowboarder - he's hoping his outfit will do the trick, I imagine. There's no more snow in Auckland, by the way. Spring is creeping a little closer, the days are becoming a tiny bit warmer, and there are lots of duck couples waddling round the neighbourhood, looking (I think) for places to lay their nests. Carla hey! I like your drawing is excellent! I send you greetings and a hug! This snow animal is HOT. More!!! Hello Carla, now I could become a follower of your blog!